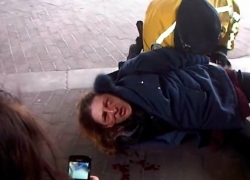 Toronto police were accused of brutality when they arrested four members of Occupy Toronto on March 30; two of the protesters ended up in the hospital. Police say they intervened at an Occupy Toronto camp behind Osgoode Hall to serve an eviction notice, but none of the accused face trespassing charges. Video of the incident shows one person having a video camera knocked from her hands before she is shoved to the ground, resulting in a fractured eye socket and a broken nose. A protest to denounce the police actions has been called for Friday, April 6. Canadian parliament passed Bill C-10, commonly known as the Omnibus Crime Bill. The controversial bill has been criticized for bringing in harsh new penalties, including mandatory minimum sentences that have proven ineffective in the United States. Ottawa activist Obert Madondo initiated a hunger strike on March 14 to protest the bill. A newly disclosed policy memo from CSIS, Canada’s spy agency, says that paying surprise work visits is a “legitimate investigative strategy,” that works to intimidate the individual. The memo was revealed as part of a legal court battle against CSIS launched by an Ottawa woman. 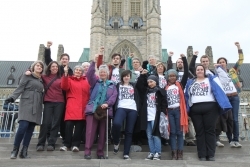 The 2012-13 federal budget was greeted with a protest in the House of Commons and criticism from a wide swath of society, including environmentalists, students, teachers, health care workers, Indigenous people, journalists and housing advocates. The budget announced the elimination of 19,200 public sector jobs; reforms to the immigration system, moving it further towards wealth and economic based immigration; fast-tracked environmental assessments on large-scale projects like the Northern Gateway pipeline; and 10 per cent budget cuts to the National Film Board, Telefilm and the CBC. The government also formally announced the increase of Old Age Security admission from 65 to 67 years of age and the elimination of the one-cent coin. "This budget fails to address the pressures of a middle class losing ground and young people struggling to find work," said a member of the Canadian Centre for Policy Alternatives. "The books will be balanced, but we'll all pay the price." Enbridge’s proposed Northern Gateway pipeline, which would carry tar sands crude from the Alberta tar sands to port in Kitimat, BC, faced further protest, as hundreds marched through downtown Vancouver. The pipeline is currently undergoing evaluation at public hearings held by the National Energy Board. More than 600 scientists signed an open letter opposing changes to the federal Fisheries Act, which would allow for the destruction of waterways so long as it does not "result in an adverse effect on a fish of economic, cultural or ecological value." One scientist told The Tyee: "It's a stupid idea. What do they think all these commercially important fish eat?” The changes were made official in the 2012-13 federal budget. Despite organized opposition, and an outbreak of the potentially deadly, and highly-transmittable “infectious salmon anemia” (ISA) at one of its pens, Cooke Aquaculture said it has no plans to stop a $150 million expansion of its Nova Scotia farmed-salmon operations. Over 250,000 people marched in Montreal against tuition fee increases. The march was part of an ongoing student campaign that has seen more than 300,000 students go on strike, some for going on six weeks. Students have promised ongoing protests until the government renounces its $1,625 tuition fee hike. The Ontario government bought out gold mining company God's Lake Resources’ stake in land placed under a moratorium against mining by Kitchenuhmaykoosib Inninuwug (KI) First Nation. KI First Nation says it never granted consent to the company’s mining on its traditional land. KI Chief Donny Morris called the victory "bittersweet," however, since the company was still able to walk away with $3.5 million from the Ontario government. Mexican anti-mining activist Bernardo Vasquez Sanchez was shot and killed in San José Progreso, Oaxaca. Sanchez was an outspoken advocate against the development of a gold mine owned by Vancouver-based Fortuna Silver. While no one has been arrested, it was a targeted attack that follows years of intimidation and violence towards anti-mining activists in the region. The BC government denied a three week extension request for the Missing Women Commission of Inquiry, scheduled to conclude in April. Commissioner Wally Oppal asked for the extension in order to find a replacement for lawyer Robyn Gervais. Gervais resigned as the representative of Aboriginal peoples' interests, in protest over the proceedings' focus on police rather than Aboriginal women. The Conservative Party called migrant and refugee rights group No One is Illegal “hard-line anti-Canadian extremists,” and accused the New Democratic Party of supporting them. "It seems as if everyone who is a dissident and stands up for equality and social and environmental justice is an extremist in Harper's corporate Canada," responded one NOII member. A community march against racism in Vancouver brought out hundreds to the city’s streets. Organized by No One Is Illegal, the demonstration came in the wake of court hearings for members of neo-Nazi group Blood and Honor, in relation to several attacks on people of colour in the city. In Edmonton and London, ON, counter-protests were organized against Blood and Honor rallies, resulting in the rallies being disrupted and cancelled. Queen’s Park in Toronto saw hundreds come out for the Ontario Coalition Against Poverty’s Fight Poverty Rally in the lead-up to the 2012 Ontario budget. A few days later, OCAP’s concerns materialized in a budget described by the Canadian Centre for Policy Alternatives as ignoring the province’s child-care crisis, cutting education funding and setting the stage for labor unrest. The Musqueam First Nation won a three-week delay in condo developments on top of an ancient burial site on their territory, now within the city limits of Vancouver. A three-day blockade of the site by Musqueam members and supporters resulted in the condo-developer agreeing to a temporary halt to construction while they negotiate a deal. The city council of Antigonish, NS, voted down a proposal to ban outdoor smoking on Main Street. While the by-law was originally proposed for health reasons, opponents argued that it would instead lead to the exclusion of, “the town’s poorest, most vulnerable citizens, many of whom enjoy a cigarette...on public benches,” as well as infringing on individuals’ rights.